Paris,1910. Emile, a shy movie projectionist, and Raoul, a colorful inventor, find themselves embarked on the hunt for a monster terrorizing citizens. They join forces with Lucille, the big-hearted star of the Rare Bird cabaret, an eccentric scientist and his irascible monkey to save the monster, who turns out to be an oversized but harmless flea, from the city’s ruthlessly ambitious police chief. A wonderful blend of The Hunchback of Notre Dame and The Phantom of the Opera (coincidentally both also set in Paris!) with a touch of Frankenstein and a dash of Beauty and the Beast. The animation is gorgeous, the storyline superbly executed, and it features a song that should have been nominated for the Best Original Song at the Oscars (La Seine – it should have won it too!). Featuring the vocal talents of Vanessa Paradis and Sean Lennon (whch blend beautifully, by the way), this is the perfect antidote to a rainy afternoon for kids and adults alike. 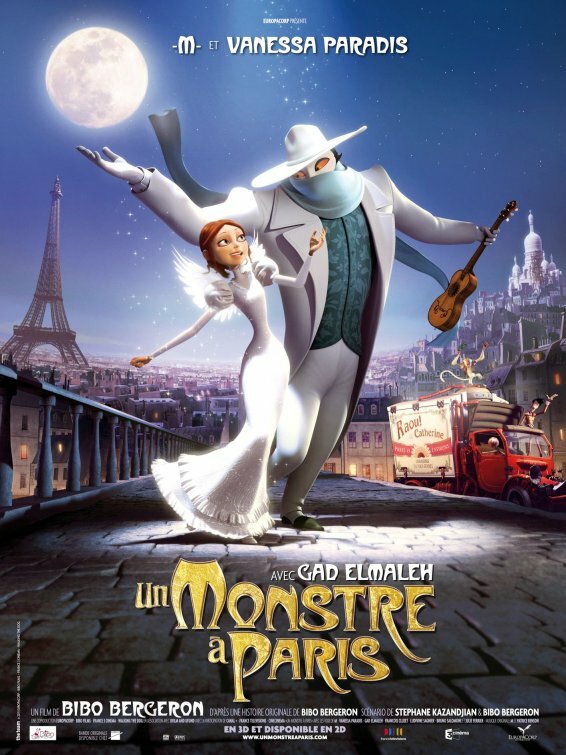 I took Xander to see this at the cinema and he’s done nothing but talk about it and ask to see it again ever since – he’s even asked me to sing La Seine for him on numerous occasions and has started joining in with it too! Of course, we saw the English version, but I’m certain the original French version is just as wonderful. This entry was posted in Films and Reviews, Pastimes and tagged A Monster in Paris, Adam Goldberg, Animated Feature, Bibo Bergeron, Danny Huston, Domestic Goddess, Film Reviews, Jay Harrington, Movies, Sean Lennon, Vanessa Paradis. Bookmark the permalink.